David DeCoteau Archives • A Talking Cat!?! We’re going to take an ever so short break from A Talking Cat!?! 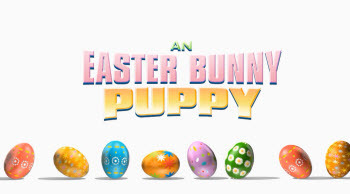 to talk about the intro to David DeCoteau/Mary Crawford’s newest straight to video release An Easter Bunny Puppy. I won’t be going through the whole film, like I’m doing with A Talking Cat!? !, but the intro can not be ignored! First off, the credits roll to the same song (a simple minded cover of a French or Spanish song that I don’t know the name of) from the A Talking Cat!?! credits. The credits END on the title of the film, instead of starting on it. Then we cut to the image of the DVD cover, which we stay on for 25 seconds. The image shows a “cute puppy” wearing bunny ears. Over our opening 25 seconds looking at a static image that doesn’t even fill the screen, we are treated to a voice over from our featured puppy. Who isn’t the puppy we are currently looking at. In fact, the voice over points out that the puppy that we’re looking at isn’t the puppy in the story. 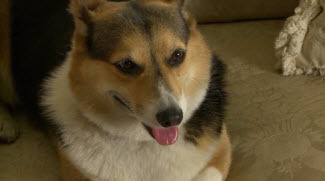 The real puppy is still cute, but it isn’t the puppy that the movie opens to. Okay, we get it. That’s not the real puppy. It’s a puppy on the cover of a book that’s being written in the movie. But why are you referencing it? And why is that the actual cover to the actual DVD of the actual movie we’re watching? 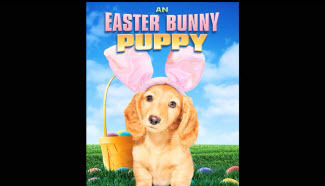 So the movie tells us to ignore that puppy, because it isn’t the puppy in this movie. But that’s the puppy we’re looking at when we decide to watch An Easter Bunny Puppy and that’s the puppy we’re looking at when An Easter Bunny Puppy starts. This movie is self referential and extremely meta, but it’s holding itself up in front of itself as a form of defense. An Easter Bunny Puppy is one long knowing wink to itself in a mirror. It’s bad and it doesn’t make sense and it says as much in the film, but it’s still bad and doesn’t make sense. But it says that. But it doesn’t make sense. But WINK! It is pretty amazing. Not A Talking Cat!?! amazing, but still pretty amazing. I am beyond excited to announce the discovery of the DeCoteaverse. I was skimming through A Christmas Puppy, another David DeCoteau production, to see if the puppy talked like Duffy in A Talking Cat!?! From what I can tell, it just provides voiceover exposition. But that’s not the exciting part. If you look at the stills I captured, the first is from A Talking Cat!?! and the second is from A Christmas Puppy. They both mention Simms Toys! This means that the characters from these David DeCoteau films share the same universe! And, from the looks of it, the same house! I’ll bring you more examples as I find them, but this opens up a whole universe of possibilities. I’m hoping for a Frankenqueen/A Talking Cat!?! crossover.